We have seen several folks doubt whether mutual funds have delivered returns over time. When in doubt, trust in data. So, here goes our analysis. 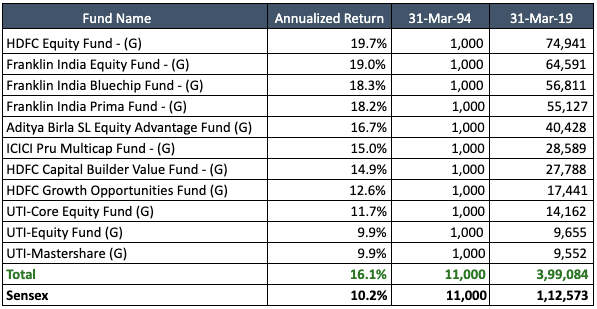 We went back 24 years and looked at the mutual funds in existence at that point in time (31-March-1995 till 31-March-2019). Those were the early days of mutual funds and there were very few funds in existence. We chose this starting period, as this was around the time when the new private sector mutual funds came into existence. Apart from UTI, just a few fund houses existed. In some cases, the original funds were being run by other fund houses, which have since then been acquired by, or merged with, other fund houses. The mutual funds, though, continue to be in place. There were only 11 equity funds which have been in existence for over 24 years. If an investor had invested Rs 1,000 in each of these funds 24 years back, the current value of the portfolio, worth Rs 11,000 then, would be nearly Rs 4 lakhs. If the investor had invested the same in the Sensex, then the same Rs 11,000 will be worth Rs 1.12 lakhs (plus dividends). At least historical data suggests that, if one buys into a diversified mix of equity mutual funds, and holds them for a sufficiently long period of time, then that person should be able to beat inflation by a sufficient enough margin and also make tax efficient returns. One may doubt and say that the future need not reflect what happened in the past, but one thing is for sure - Your investments need to beat inflation in order to secure your retired life.